We often look at how suppliers perform in any one given market – but how do those operating in a number of life science markets ensure that they maintain growth across all. Does success in one market automatically indicate success in others, or do some companies find that one life science area leads to growth, whereas others are a little more difficult? Today we begin a new series of data-driven posts focused on those suppliers that operate over a number of markets, looking at their market share in each and exploring the challenges and successes they experience. We’ll start by looking at two larger suppliers, MilliporeSigma which is the combination of Sigma-Aldrich and Merck Millipore, and BioTechne, the umbrella company including brands Novus Biologicals, R&D Systems and Tocris Bioscience. 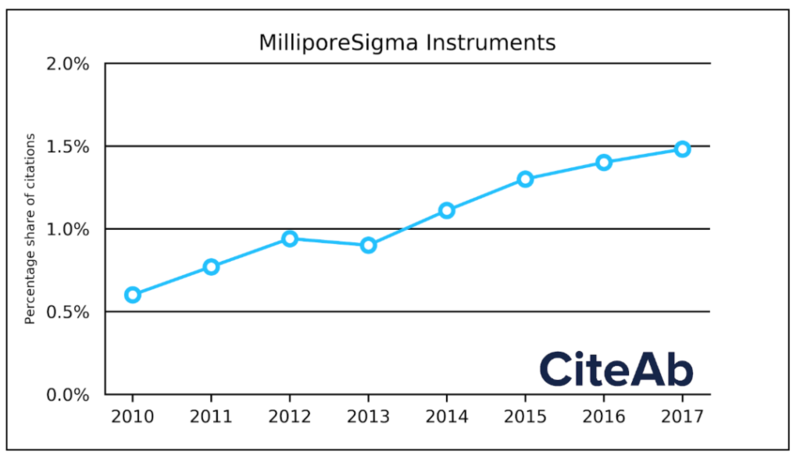 Citations for MilliporeSigma have dropped over the past eight years, however the company remains comfortably within the top five of global research antibody providers. BioTechne’s citation share trend in the research antibody market has been flat over the last few years with little market share lost or gained. The company was 7th in rank for antibody citations in 2017, the position they have held since 2010 which, given the increasing number of companies challenging for a spot in the top 10, is no easy feat. As we now collect data for multiple life science markets here at CiteAb, with our team analysing data from nearly a million citations for over 200 suppliers. This means we can look at how both MilliporeSigma and BioTechne are performing in other markets. MilliporeSigma operates in the research biochemicals market, and our data suggests the company dominates with over 66 per cent of citations for the last eight years combined. The recent alliance between the company and Avanti Polar Lipids to provide Avanti products, we suspect, will further cement their position at the top going forward. 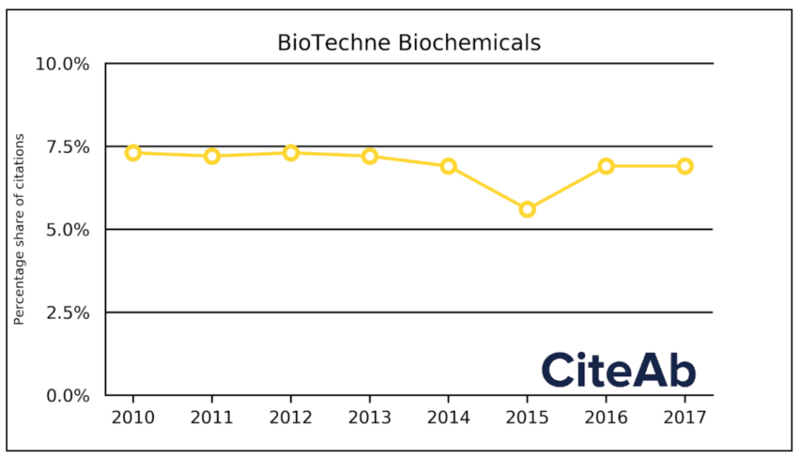 Tocris Bioscience, a subsidiary company of BioTechne, has shown a flat citation trend in the research biochemicals market and was the 3rd most cited supplier in 2017. The company has a way to go yet, but if it continues this trend it could provide strong competition to MilliporeSigma over coming years. We recently began collection of instrument citations, with our initial focus on Flow Cytometers. BioTechne doesn’t operate in the flow cytometer market, however MilliporeSigma does, and has share of citations in 2017 – placing them in 3rd place globally. Rhys goes on to add: “Whilst BioTechne are not present in our current instrument data due to its focus on flow cytometers, the company does have another brand called ProteinSimple which manufactures and supplies a range of analytical instrumentation from Simple Western systems to FluorChem Systems and AlphaImagers. As our instrument data grows over the coming months it will be interesting to see how BioTechne fairs. Today we are giving away graphs showing all of the reagent type data for both MilliporeSigma and BioTechne for free to our blog post readers, to get yours just sign up below and it will be delivered to your inbox. If you would like to stay informed about all of our latest market data, by signing up below for our free data you will also receive alerts. Alternatively contact Rhys to discuss a quote for the full antibody supplier share dataset, or our datasets on Biochemicals, Instruments, and Kits and Assays that might be of interest.